In 1932, two parks on different sides of an international border came together to become Waterton-Glacier International Peace Park, the first of its kind in the world. This week, people will stand in the park on both sides of the Canada-US border and hold hands across lines, symbolizing friendship and renewing a shared commitment to work together for transboundary conservation. Hands Across Borders is a week-long event taking place in Glacier National Park from September 13-18. The event is bringing together transboundary conservation practitioners from around the world to share ideas and best practices, build relationships and chart a course of conservation and cooperation for the future. The event also celebrates local leaders like Rotary International, who have played a large role in environmental peacemaking worldwide. The past, current and future roles of indigenous peoples on both sides of the border is also being highlighted and emphasized. "Transboundary conservation was pioneered in the Waterton-Glacier International Peace Park and this week people from all over the world are gathering to celebrate it,” said Harvey Locke, Strategic Advisor to the Yellowstone to Yukon Conservation Initiative (Y2Y). “But the world's oldest example of a Peace Park is still incomplete because of the missing piece in BC's Flathead River Valley. We Canadians have to catch up to what the Americans have done on their side of the border," Locke added. Local transboundary conservation coalition, Flathead Wild, made up of Canadian and American environmental groups, is an example of the work that continues on the ground to advance the goals of the Peace Park. 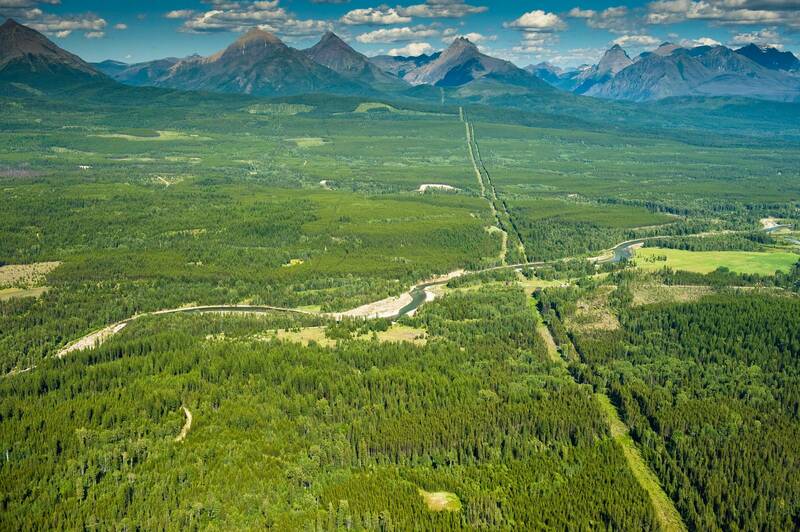 The coalition seeks to fill in the missing piece of Waterton-Glacier International Peace Park by permanently protecting the adjacent Flathead River Valley in British Columbia. “The Flathead represents the epicenter of biodiversity in the Rocky Mountains, and is a biodiversity hotspot of global significance. Expanding the park into British Columbia builds on both our new scientific understanding of this fact as well as the inspiring work of Rotary International in 1932 with the creation of the Peace Park,” said Dave Hadden, Executive Director of Montana Headwaters Association. Hands Across Borders celebrates what can be accomplished when we work together to protect wilderness values and promote peace, and inspires continued cooperation. Caption: The US-Canada Border as seen from Mt. Hefty in the Flathead Valley, the ‘missing piece’ of Waterton-Glacier International Peace Park.